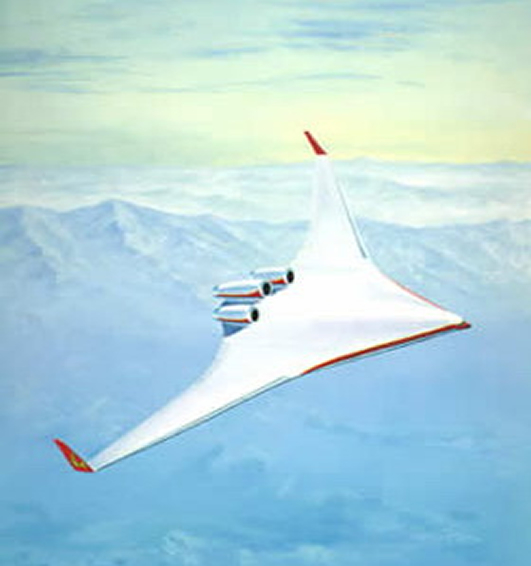 GIANT 797 BLENDED WING 3 ENGINE AIRLINER? 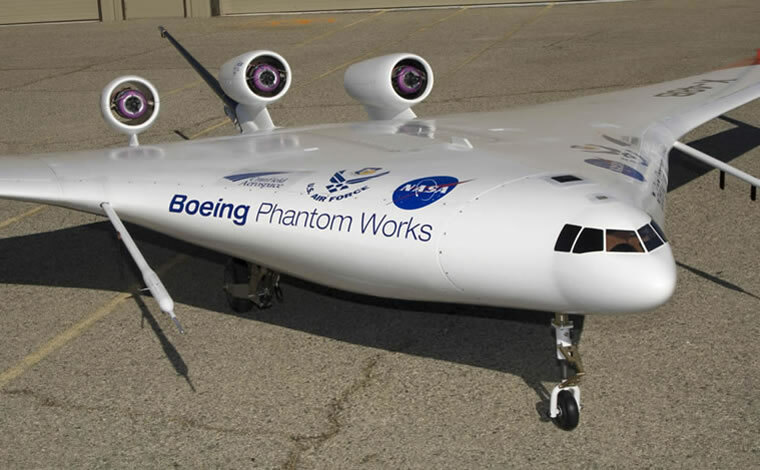 Boeing MAY be preparing a 1000 passenger jet that could reshape the Air travel industry for the next 100 years.The radical Blended Wing design has been developed by Boeing in cooperation with the NASA Langley Research Centre. The mammoth plane will have a wing span of 265 feet compared to the 747's 211 feet, and is designed to fit within the newly created terminals used for the 555 seat Airbus A380, which is 262 feet wide.The new 797 is in direct response to the Airbus A380 which has racked up 159 orders, but has not yet flown any passengers. 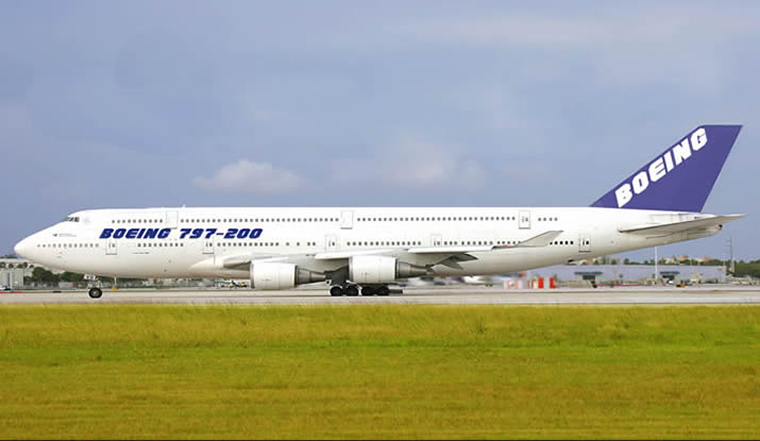 Boeing decided to kill its 747X stretched super jumbo in 2003 after little interest was shown by airline companies, but has continued to develop the ultimate Airbus crusher 797 for years at its Phantom Works research facility in Long Beach, Calif. The Airbus A380 has been in the works since 1999 and has accumulated $13 billion in development costs, which gives Boeing a huge advantage now that Airbus has committed to the older style tubular aircraft for decades to come. 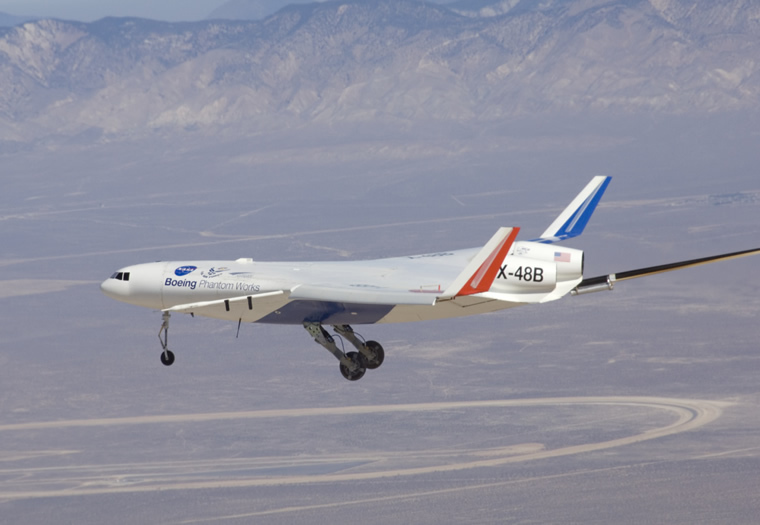 There are several big advantages to the blended wing design, the most important being the lift to drag ratio which is expected to increase by an amazing 50%, with overall weight reduced by 25%, making it an estimated 33% more efficient than the A380, and making Airbus's $13 billion dollar investment look pretty shaky. High body rigidity is another key factor in blended wing aircraft, It reduces turbulence and creates less stress on the air frame which adds to efficiency, giving the 797 a tremendous 8800 nautical mile range with its 1000 passengers flying comfortably at mach .88 or 654 mph (+-1046km/h) cruising speed another advantage over the Airbus tube-and-wing designed A380's 570 mph (912 km/h) The exact date for introduction is unclear, yet the battle lines are clearly drawn in the high-stakes war for civilian air supremacy. 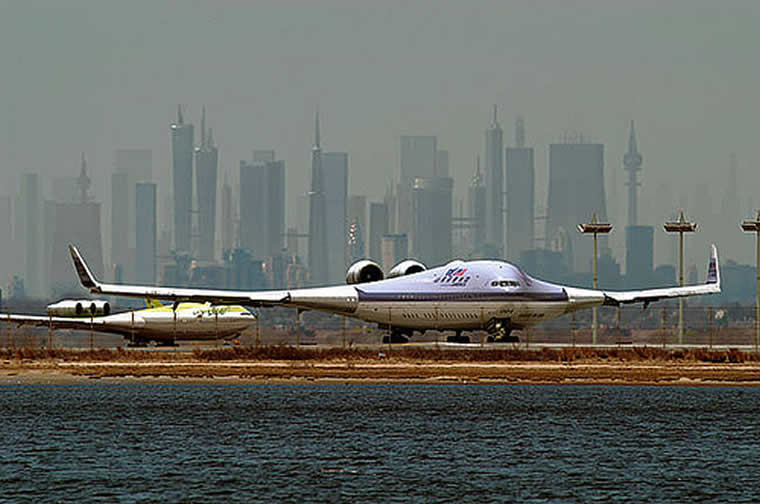 The image is a conceptual picture from an article about the future of aviation proclaiming it to be Boeing's response to competition from the Airbus A380 in the commercial airliner business. Boeing is developing the 797 to compete directly with the massive, but more traditionally built, Airbus A380. Featuring a blended wing/body co-developed with NASA, it introduces a completely new design, looking more like a stealth bomber than a 747. Able to hold 1,000 passengers on two levels, the new design increases the efficiency of the aircraft by 33% while increasing its speed to mach 0.88, or 654 mph — a significant bump from the A380's speed of 570 mph. This speed increase is a result of the 25% weight reduction and improved aerodynamics that the new body design features. The wingspan of 265 feet is over 50 feet longer than the 747's but only 3 feet more than the A380's. There's no word on when the 797 will be hitting runways near you, if ever, but it certainly has the potential to herald in a new era of commercial air travel. If it features improvements in airplane food as drastic as its improvements in energy efficiency, it might actually get us to travel more, too.